I hadn't been sick in almost 2 years, and I like to pretend that it's because I eat ridiculous amounts of fruit and vegetables, rarely eat processed foods, and get a lot of exercise (but it's probably just luck). Unfortunately my streak ended this weekend. Getting sick the day after Christmas is a cruel joke because there were tons of leftovers that I wanted to enjoy, yet I had no appetite. I tried to eat more of this amazing potato and leek gratin yesterday, but I couldn't really enjoy it because the process of swallowing hurt so badly that I couldn't focus on the delicious taste. On the plus side, there was a turkey carcass hanging out in the refrigerator, so Mom made me turkey soup last night that seems to have miraculously cured all of my problems. When I woke up for the third time today, I felt amazingly better. I can only stay awake for about 5 minutes at a time (I actually had to take a short nap in the shower), but I can now swallow without grimacing. And I still don't have much of an appetite for most things (except for turkey soup... and popcorn, for some weird reason), but I'm hoping that I'll be able to enjoy the last of the leftovers tomorrow. 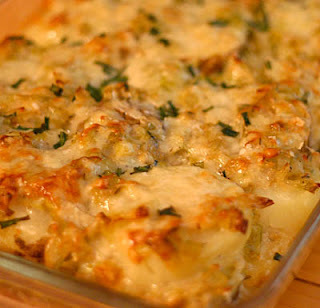 This potato and leek gratin was, after all, amazing. Mom found the recipe and wanted me to make it for Christmas day, but I realized that it wouldn't work because it needed a long time in the oven, and wouldn't fit with the turkey. I couldn't disappoint Mom, though, so I parboiled the potatoes to reduce the cooking time, and it was fabulous. Even though I enjoyed the simple potato gratin that I made last month, this blew it out of the water. In fact, Mom suggested that I make another one before I go back home (we'll see if I have enough energy...). It isn't a light dish, and it won't be something that I make very often, but it's very filling, and even a few bites is very satisfying. Bring a large pot of water to a boil, add potatoes, and cook until they begin to get tender, but aren't falling apart (about 20-30 min, depending on the size). Then let the potatoes cool slightly and cut into 1/4" slices. If you skip the boiling step and use raw potatoes, increase the baking time (see below). While the potatoes are cooking, melt the butter over medium heat in a large saute pan. Add the leeks and salt, stir well, cover, and cook for 20 min, stirring occasionally. Then add thyme, nutmeg, pepper, and cream, and cook uncovered for 15 min. Combine the cheeses in a large bowl, and lightly oil a 9x13" baking pan (or one that's slightly smaller). Layer 1/3 of the potato slices in the bottom of the pan, and then 1/3 of the leek mixture, 1/3 of the cheese mixture, and 1/3 of the chives. Repeat the layers 2 more times. Cover the pan with foil and bake at 375 for 25 min, then uncover and bake for another 20 min, or until brown on top (if you didn't boil the potatoes, then bake at 400 for 45 min covered, and 30 min uncovered). Let sit for 10 min before serving. Serves 10-12. There are a million types of pie, but my favorite is a simple sweet potato pie. 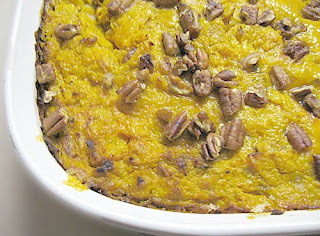 I will never understand the pumpkin pie craze around Thanksgiving - to me, sweet potatoes have a much better flavor. 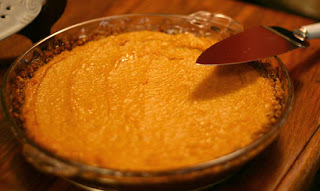 A good sweet potato pie lets the natural sugars shine through, and only uses a bit of spices to enhance the flavor. I made this pie at Thanksgiving, and Mom requested another for Christmas. I was happy to oblige. With tons of fresh Georgia pecans lying around the house, I decided to try out a pecan crust that I noticed over at Kalyn's Kitchen. It's SO easy, and I think I prefer it to standard pie crust. At Thanksgiving it came out perfectly, but did get a bit soggy in the middle this time. It was still delicious, though, and I'm guessing that it's because I used milk instead of half-and-half, and next time I'll go back to the thicker stuff or use a little bit less liquid. I really like the concept of this crust, and it allowed me to avoid spending lots of money stocking my parents' house with gluten-free flours. I imagine that it would be great with any nut, but I'll have a hard time straying from pecans. Rub the butter over the bottom and sides of a 9" pie pan. Pulse the pecans in a blender a few times until they make a pecan meal consistency (don't overdo it - you don't want to make pecan butter). Pour the meal into the pie pan and press down on the bottom and sides. Bake the sweet potatoes on a baking sheet at 400 until very tender (60-80 min, depending on the size). Let the sweet potatoes cool until you can handle them, and then peel and mash them. Measure out 2 cups of sweet potato (a little bit more is ok), and combine it with the honey, half-and-half or milk, vanilla, and spices in a large bowl. Adjust the spices to your taste, and then stir in the eggs. Pour the filling into the prepared crust and bake at 400 for 35-45 min, until it's set in the middle (jiggle the pan a little bit to check it). Let cool and serve room temperature, cold, or warm. Make sure to store leftover pie in the refrigerator. Serves 8-10. I had grandiose ideas of making all kinds of homemade Christmas gifts for my family and friends, but a lot of last-minute traveling foiled my plans. Luckily, I had already acquired most of the necessary ingredients for a few of my ideas, and I quickly threw together several batches of two soup mixes and two kinds of nuts in the 11 hours that I was home between one trip and the trek to Florida for the holidays. I had something more elaborate in mind, but it worked out ok, and will be a more useful present than anything else that I could imagine. If you're in need of a last-minute Christmas gift, I have just the answer. And if you only have time to make one thing, I highly recommend the sweet and spicy nuts that I adapted from David Lebovitz. I ate quite a few as they were cooling, and had to keep them in my trunk for the drive to Florida so that I would resist eating the presents. The other nuts are very tasty, too, and the soup mixes are always nice to have on hand, so you really can't go wrong with any of these. Soak the beans overnight in a large pot. Drain beans, and add spice mix, water or stock, and tomatoes. Bring this to a boil, reduce heat, cover, and simmer until beans are tender (about an hour and a half). Season with salt and pepper. Place pea mix, spice mix, water or stock, and meat in a large pot, bring to a boil, and then reduce heat, cover, and simmer until peas are tender (45-60 min). Season with salt. Spread the nuts out on a baking sheet and roast at 350 for 10 minutes, stirring once. Combine the remaining ingredients, pour this mixture over the nuts, and stir well. Bake for about 15 more minutes, stirring occasionally. 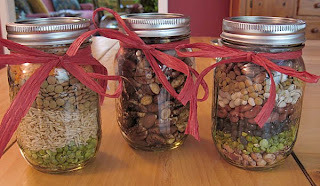 Let cool and place in jars. Makes enough for 3 pint jars. Spread the nuts out on a baking sheet and roast at 350 for 12 minutes, stirring once. Pour the tamari and paprika over the nuts, stir well, and continue to bake for 5 more min. Let cool and place in jars. Makes enough for 3 pint jars. It turned out to be the perfect time to pick Mexican Everyday for the cookbook of the month. Most of the recipes come together extremely quickly, and I've only had a few minutes to spare (if that) for the last few weeks. Life has been crazy, but in an extremely good way (I'll share more when I finally make some decisions in the next month or so). Moles can be intimidating (and no, I'm not talking about the small, adorable rodents that are probably digging up your yard at this very moment). Many of the authentic moles require tons of ingredients and an entire day's worth of work. Eventually I want to try one out, but this is not the right time (nor the right place to find the necessary ingredients). Luckily, Rick provides a recipe for a simple, everyday mole, and I thought that it was fabulous. I loved the combination of the chicken and vegetables, and the sauce was fantastic. 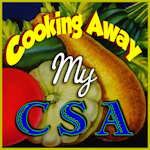 It's not very spicy, but has a great flavor that seeps into the chicken and potatoes. Combine the chiles, tomatoes, onion, garlic, cumin, cinnamon, oregano, and 1 cup broth in a blender, and process until smooth. In a large pot, heat the oil over medium-high heat, and strain the blended mixture into the pot (pressing down to get as much through the strainer as possible). Cook this mixture, stirring frequently, until it resembles tomato paste (about 7 min). While this is cooking, add the masa harina to the remaining broth, and stir well. Add this to the chile mixture in the pot, bring to a boil, and cook for about 10 min or until it thickens, stirring frequently. 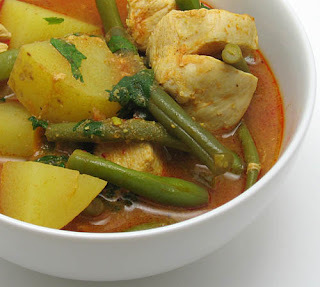 Reduce heat to medium-low, and add the chopped chicken, green beans, potato cubes, and salt. Simmer for about 25 min, or until the potatoes and green beans are tender, stirring frequently. Add the cilantro and season with additional salt, if desired, just before serving. Serves 4. I was going to wait until I made this again and took a better picture (it seems to disappear before I can take the time for a good photo shoot), but I can't wait any longer to share this amazing recipe. I first made this for my pre-Thanksgiving bash, and people literally scraped the dish clean. I knew that I had to make this dish for real Thanksgiving, but it's great for non-holiday meals too. This lends itself perfectly for advanced preparation, and all you have to do is pop it in the oven for an hour. I'm a big fan of butternut squash by itself, but this takes it to a whole new level. (On an unrelated note, I just had a concoction of butternut squash, black-eyed peas, and swiss chard that was amazing. I don't know if it compares to this casserole, though.) If you want to convert winter squash-haters, this is your dish. I've already had more requests for this recipe than I've had for any other dish. Seriously. Make it now. Rebecca over at Ezra Pound Cake also suggests adding sausage or spinach, and I'm going to try one (or both!) next time. 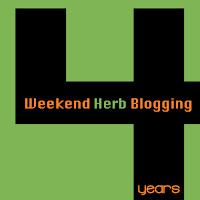 Despite the bad picture, I'm submitting this to Weekend Herb Blogging to share my new favorite way to use winter squash. Haalo from Cook (almost) Anything At Least Once organizes this event, and is hosting this week. Bring a large pot of salted water to a boil, add squash slices, and cook until squash is tender (about 8 min). Drain squash and set it aside. Add the butter to the pot, wait for it to melt, and then saute onions until tender. Add squash back to the pot, mash it with the onions with a potato masher, and then add the buttermilk, eggs, thyme, breadcrumbs, salt and pepper, 1/4 cup pecans, and 1 cup cheese. Blend well, and pour into a lightly oiled 9 x 13" baking pan (you can refrigerate or freeze it at this point). Bake at 375 for 45 min, and then top with the remaining pecans and cheese and continue to bake for 15 min. Serves 12. If you're looking for a delicious gluten-free cake that is so amazing that you'll want to eat the entire thing, I have your answer. My friend Laurel directed me to this recipe, and I'm so glad that she did. The combination of the nuts and honey is unbeatable, but it's not very sweet (which is exactly how I prefer my cake). 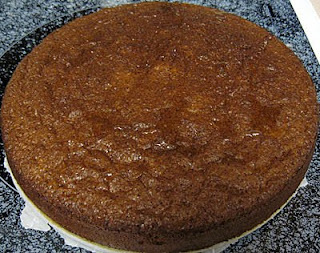 I was very impressed that the cake stayed very moist for several days, until we finally polished off every last morsel. Process pecans and almonds in a blender or food processor until they are in a fine meal (don't overdo it here - you're not trying to make almond/pecan butter). You want about 2 cups of meal, so add more nuts if necessary. Separate the eggs, and beat the yolks with honey, vanilla, baking soda, and salt with an electric mixer until combined. Add the pecan and almond meal, and continue to beat until well mixed. Rinse and dry your beaters, and beat egg whites in a separate bowl for about a minute, until they're foamy and double in volume (but not to the point that they hold peaks). Fold the egg whites into the nut meal mix, and pour this into a springform pan that has been lined with parchment paper on the bottom and lightly oiled. Bake at 350 for about 30 min, until a knife inserted in the center comes out clean. Let cool for 10 minutes, and then remove the sides of the pan. Before serving, drizzle with a little bit of extra honey, if desired. Serves 10. * To toast nuts, heat them over medium heat in a large, dry skillet. Stir frequently, until they begin to brown and are very fragrant (usually about 7-8 min). It's about time that I introduce you to December's cookbook of the month, Rick Bayless's Mexican Everyday. It wasn't a hard decision this month, and I instantly knew that this book would quickly be making its appearance when I unwrapped it on my birthday. As I've said before, I love Rick Bayless's Frontera Grill (and can't wait to try Topolobampo and Xoco), and this book will hopefully satisfy me between trips to Chicago. When I was first flipping through the book, I was pleasantly surprised by the numerous variations on each recipe. At a busy time of the year (when I may not want to deal with snow to get to the store), it's nice to have some ideas for ways to use what I have on hand. I started with this spinach and mushroom enchilada recipe, and I wasn't disappointed. This isn't your typical Tex-mex enchilada that's been slathered in cheese and baked to death (it is supposed to have cheese crumbled on top, but in the chaos of life, I totally forgot). It has excellent flavor, particularly the sauce, and isn't heavy at all. The sauce was so good that I found myself eating spoonfuls of it. Next time I'll add cooked, shredded chicken to the spinach and mushroom filling (per Rick's suggestion) for a more filling meal, but I enjoyed it as is. They're no substitute for Frontera, but they're better than any other Mexican food that I've had in a long time. Combine garlic, jalapeno, tomatillos, and cilantro in a blender, and blend until smooth. Heat half of the oil over medium-high in a small saucepan. Add tomatillo sauce, and cook about 10 min, stirring frequently. Add the broth, reduce heat to medium, and continue to cook another 10 min (this is a good time to prepare the filling and tortillas). Add a spoonful of the sauce to the yogurt, and then stir this mixture back into the sauce. Season with salt. Heat the remaining oil in a large skillet over medium high. Add the mushrooms, and cook until they start to turn brown (a few minutes), stirring frequently. Add the onion (reserving a few slices for garnish, if you want), and continue to cook for another few minutes. Stir in spinach, and cook until the spinach wilts. While everything else is cooking, lightly oil the tortillas, lay them out on a baking sheet (it's ok to double them up), and bake at 350 for about 3 min. 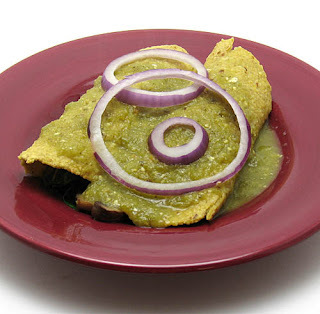 Dip each tortilla into sauce, and add about 1/4 cup spinach and mushroom mixture in the middle. Roll them up and top with sauce. Sprinkle with cheese, if you remember, and garnish with onion slices. Serves 2-3. I now present my favorite dish that I made for Thanksgiving #1. The best part of this salad is that it's good warm, room temp, or cold, so you can make it whenever you feel like it. I started cooking my rice about the time the turkey went in the oven, then prepared the rest whenever I had a few minutes to spare. 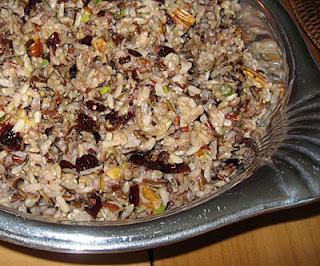 I loved the combination of rices, pecans, and cranberries, and the dressing was subtle enough to let the other flavors shine through. Quality nuts do make a big difference - I used ones from the new crop of south Georgia pecans that my mom picked up a few weeks ago. I love them so much that I put pecans in just about everything I made for both Thanksgivings (and quite a few sneaked into my mouth during preparation). Combine rice, water, salt, and butter in a large saucepan. Bring to a boil, reduce heat, cover, and let simmer for 50 min. Remove pan from heat and let sit an additional 10 min (or more, if you're not ready to assemble the salad). Stir rice, cranberries, pecans, and green onions together. In a small bowl, combine lemon juice, oil, honey, and orange zest, and season with salt and pepper. Toss this dressing with the rice mixture. Serves 8. Well, it's about time to wrap up November's cookbook of the month, The Whole Foods Market Cookbook. The book has an entire section dedicated to burgers, patties, and griddlecakes, and I wanted to try at least one. I ended up picking these because millet and sweet potatoes are two of my favorite foods, and I almost always have them around. 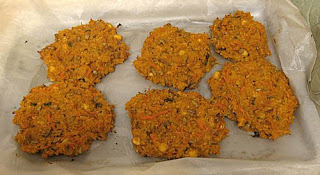 They were good, and despite all of the ingredients, I appreciate that you could taste the millet and sweet potato. They have a lot of different textures, with the sunflower seeds providing a particularly distinctive crunch. They definitely do not resemble hamburgers (or those veggie burgers that try to imitate meat), but it's great for an alternative burger. This recipe was supposed to only make 3 burgers, and I would hate to see the mouth of the person who could fit one of those in. Overall, this book is pretty good. I LOVED the King Ranch casserole (though I made a few big changes), and I really enjoyed the lentil and sausage soup, parsnip mashed potatoes, and these burgers. I also made a red beans and rice dish that was only so-so. I'm sure I'll open this book from time to time, but it's hard to compare it to the previous cookbook of the month, Vegetarian Planet. Combine millet, sweet potatoes, and water in a medium saucepan. Bring the water to a boil, and then cover, reduce heat, and simmer for 30 min, or until the water is completely absorbed. Add the chickpeas and mash with a potato masher or the back of a spoon. Stir in the remaining ingredients and season with salt and pepper. Divide into 6 equal patties and place on a baking sheet lined with parchment paper. Spray patties with olive oil and bake at 400 for 20-30 min, until patties are golden brown and firm. Serves 6.